Boost your motivation levels when you need it most with this updated free sales training eBook and be prepared for all your sales meetings with prospects. See a unique sales training technique to link customer needs to the features and benefits of your products to help you to close more sale. 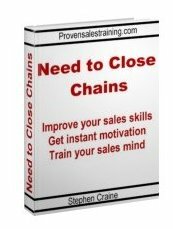 We’ve added lots more pages to the Need to Close Chains eBook course since we first gave it to sales people that sign up for this newsletter. There's more detail on how to use the technique in many different ways. There's more information on how to use it to train your sales teams. And in response to your request, there's more information on getting into a motivated selling state in preparation for meetings with buyers. As a sales training technique. As a motivational state changer. To learn new product knowledge. And as an ice breaker in meetings. The training connects the needs, wants, and desires of your customers to the feature and benefits of your products and services. Because of these new connections that you learn you can meet buyer’s requirements with a range of specific benefits, and explain how they are delivered by the product features, and give a value based sales presentation that will convince prospects to buy from you. When you use the technique it gets you into the selling state of mind and that means you can get customers into a buying state of mind. You will be able to get into a motivated state and access all your resources, knowledge, and skills. When we first published the Need to Close Chains we got a great response from our readers. You asked us to give more detail on the technique and its uses, and how it can be combined with the professional courses available on the website. So that’s exactly what we’ve done and because you already receive the Sales Buzz ezine you get the training ebook for free with the special link below. You don’t have to take any action other than clicking the link below or the image above. Feel free to pass it on to colleagues and use it in whatever way benefits you.